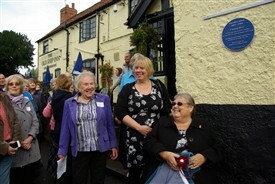 Pictured at the unveiling of the plaque are (left) Barbara Worrall, Chairman of the Lowdham Local History Society, Harold Cootam's GreatGranddaughter, and (seated) his Granddaughter, Wendy Gell. Saturday – October 19th 2013 – a day to be remembered. 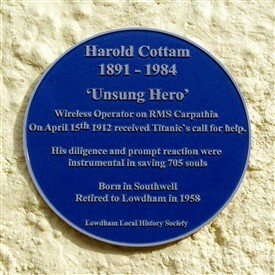 After his retirement Harold lived in Lowdham from 1958 – 1964. We were delighted that several relatives of Harold were able to attend the ceremony and his granddaughter Mrs Wendy Gell was there to perform the unveiling. Early in the morning the clouds were dark and rain was falling but by midday the sky was bright, the sun shining and about 100 folk had gathered for the occasion. Our Chairman Barbara Worrall opened the proceedings and introduced some of the guests including Gerard Sharp whose father Aslin - who many of you will remember – wrote Harold’s obituary for The Times newspaper – citing it from memory over the telephone as he was on holiday at the time of Harold’s death. Graham Anthony, a marine lecturer said a few words and our ‘in house’ musicians Hannah and Jaimie on cello and violin respectively, added a nostalgic touch with their lovely rendering of’ Nearer my God to Thee’ and other patriotic works. Another surprise guest was Robert Crawley from St Albans trailing Harold’s beautifully restored Scott Flying Squirrel motor racing bike. Following the unveiling, The Old Ship provided us with drinks and lovely refreshments while we watched short slide shows and viewed a display of articles and newspaper cuttings relevant to the occasion. The History Society would very much like to thank all those people who gave generous donations, their time and their help to make this day a truly memorable occasion. Click HERE to read Harold Cottam's story. The above article first appeared in the November 2013 edition of the Parish Magazine for Lowdham with Caythorpe and Gunthorpe, to which we express our thanks for permission to republish. This page was added by Website Administrator on 29/01/2014.